Like most of you (I’m assuming), I’m torn between wanting to go more natural with my skincare but at the same time, I don’t want to risk cutting out science led products for fear that everything will suddenly go south. But my recent experience with Jurlique skincare (you might remember a post from not too long ago about the skincare I took on holiday with me) has convinced me that going natural every so often really benefits my skin, both in terms of its health and appearance. 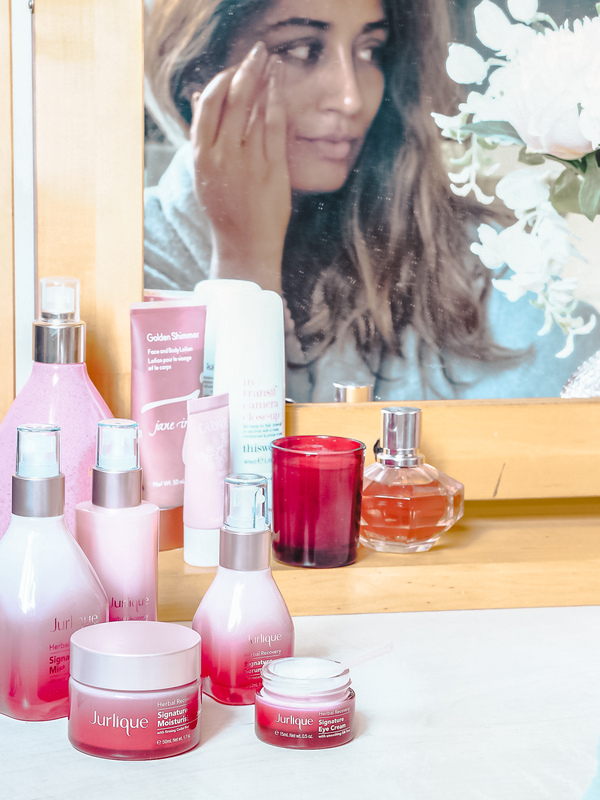 As soon as I got back from holiday, I found myself invited to the launch of the newest, and very exciting skincare range from the same brand, Jurlique, which I’ve since been trialling for the best part of summer. 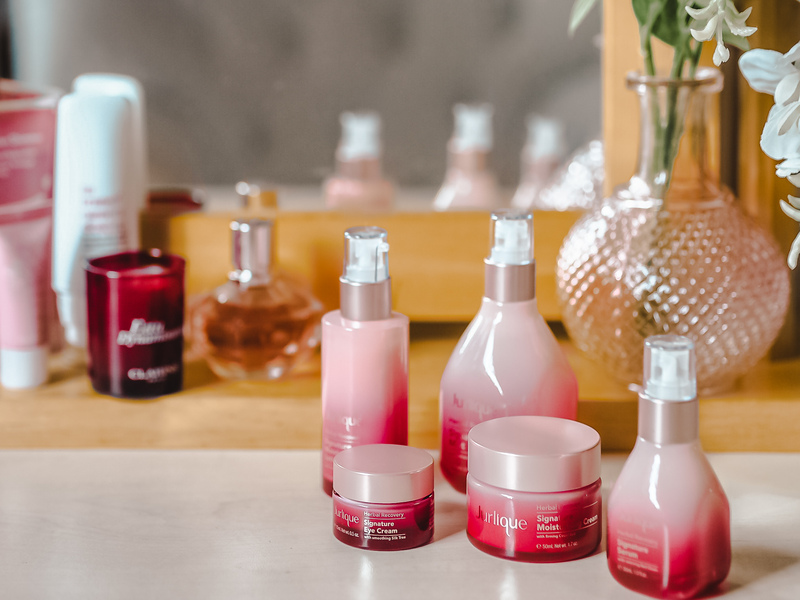 The new Herbal Recovery Signature Range launches tomorrow, on Monday 3rd September, so if you’re thinking of investing into the collection, then here are my thoughts. First off, the packaging. You’d be forgiven if you just wanted to buy all of the products just because they are so very beautiful. 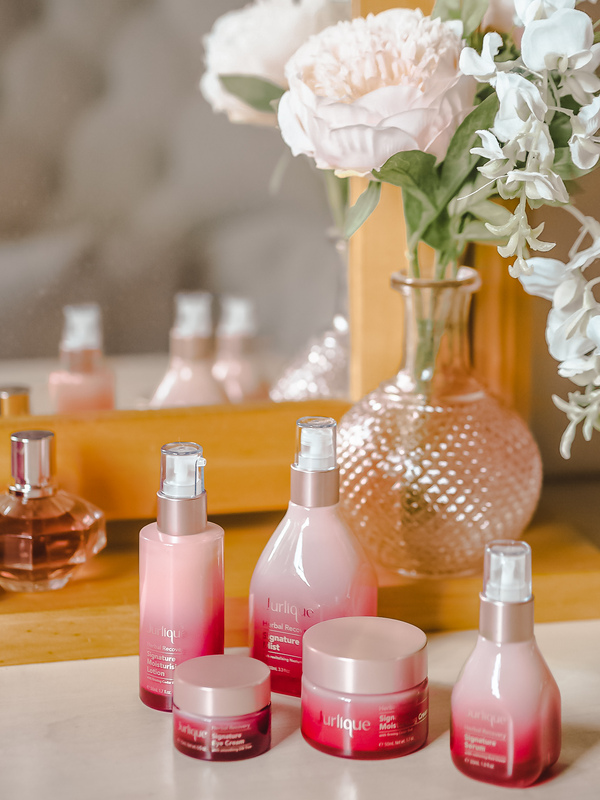 Rose gold accents, a beautiful petal pink ombre-ing through to a romantic red rose colour, yes, I’ll admit, the collection looks so beautiful and it makes me happy every morning to see it on my dressing table. But it’s the power of the ingredients inside that I want to tell you about, the reason why I’ve loved using them and continue to keep them within my skincare routine. By harnessing the power of natural, organic extracts Jurlique has created a range that addresses fine lines, revitalises and smooths the skin, illuminates hitherto dullness and really nourishes and plumps where needed. Using a powerful blend of pure botanicals, high in concentrated antioxidants, there are two key ingredients which are common to all five products in the range: the Viola Tricolor extract which helps to minimise the signs of ageing and reduce dullness, and Yarrow extract, which helps to rejuvenate, smooth and plump. Added to this, each of the products contains a key active star ingredient to amp up its efficacy. I’m sure you’re all familiar with Jurlique’s Signature Mist. The iconic blend of Rose, Marshmallow Root, Lavender and Calendula along with the Yarrow and Viola Extract infusion has been given extra oomph with the inclusion of revitalising Nasturtium to give a gorgeous glow to the face, whilst brightening Citrus Unshiu Peel and Japanese Cedar Bud extracts soften the skin. 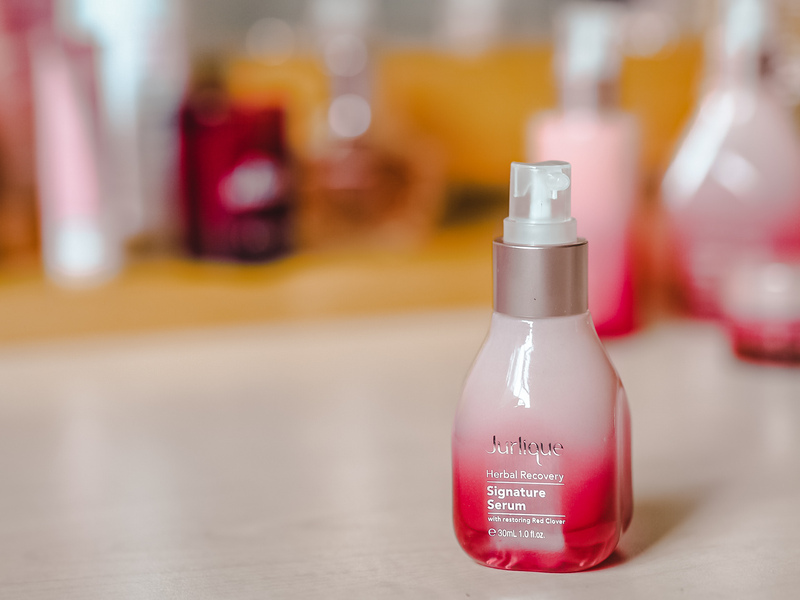 It’s great for misting throughout the day for a little pick me up, but also fab for preparing your skin for the next step in your skincare routine. If you asked me which ONE product out of the range you should try, it would be the serum. The Herbal Recovery Signature Serum literally feels like a little bit of magic on the skin. I can immediately feel it plumping my skin from within, no matter what other skincare brand I use under or over it. And I can feel the effects of this serum all day. 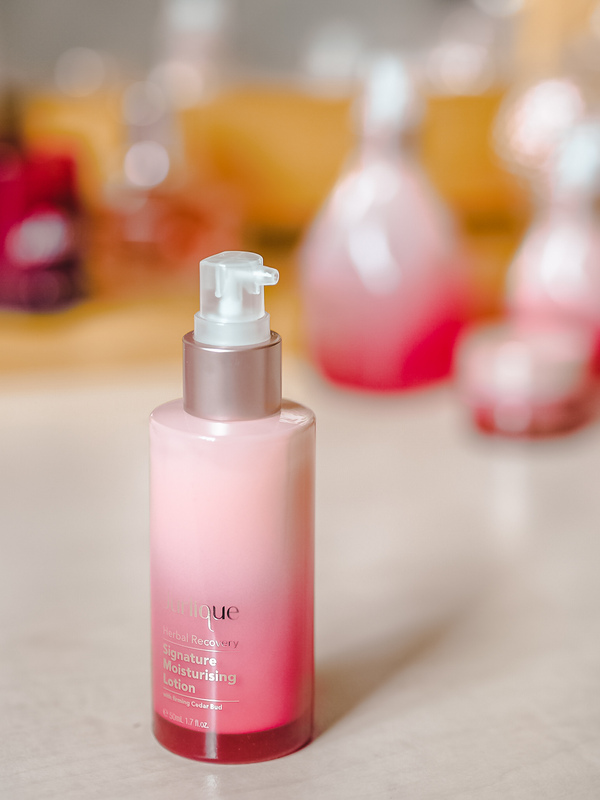 The added key ingredient in the serum is the Red Clover Flower extract, which has been scientifically proven to enhance the hydrating effect of Hyaluronic Acid (hence the feeling of plumpness). 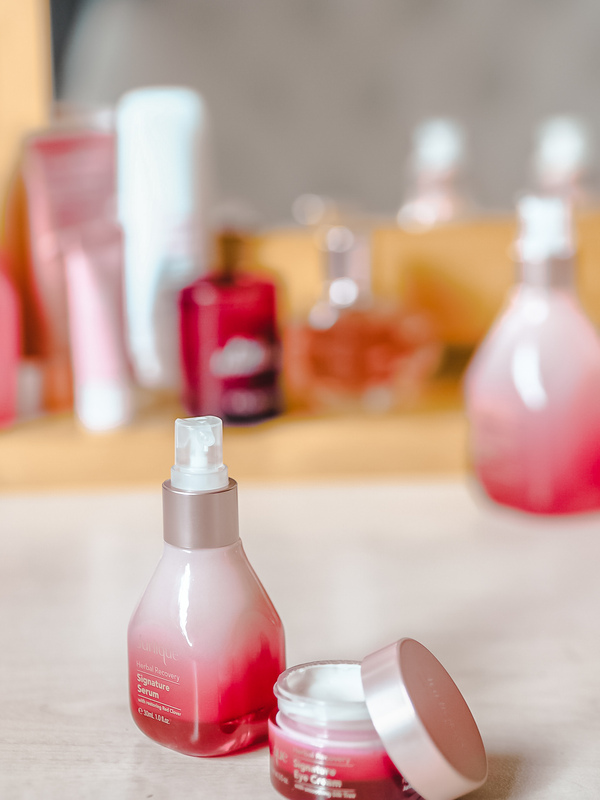 In consumers tests, 87% of women said they could see a visible reduction in fine lines and an increase in plumpness (can you tell how much I’m loving that word!). By the way, it’s super-light in consistency; when you first use it, you might wonder how something so lightweight, almost watery, can do anything for you. Trust me; give it a minute and you’ll feel the effect! In terms of moisturisers, the Herbal Recovery Signature Range has a choice of a Lotion and a Cream. During the hot summer we’ve been so lucky to have here in the UK, I’ve been turning to the Lotion, both day and night, as I can’t stand the mask-like feeling of a cream on my skin when I’m hot and bothered. But as the summer sun has finally said its goodbyes in London, I’ve already found the cream to be a great alternative at night, and I’m sure I’ll be using in the daytime too as we head into Autumn. (The Cream is incredibly lightweight considering how nourishing it). Japanese Cedar Bud extract in both the Lotion and the Cream helps the skin to feel firmer and is beautifully illuminating. Last but not least within the range is the Herbal Recovery Signature Eye Cream. 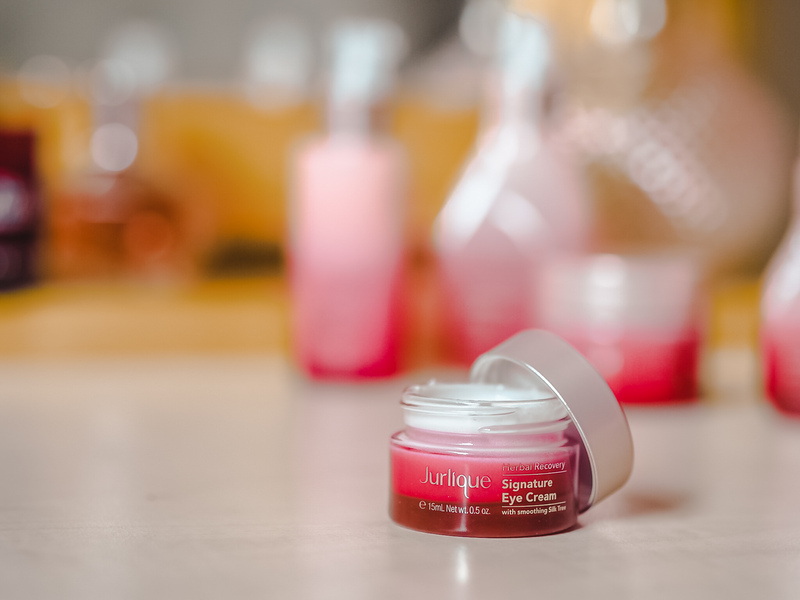 After the fabulous results I had using the Nutri-Define Eye Cream, you’ll understand why I was excited to try this one, and I’m pleased to say I wasn’t disappointed. Richly nourishing yet lightweight on the skin, loaded with plant-based antioxidants and perfect under concealer, it’s beautifully moisturising and soothing for the delicate eye are – the only area where I’m prone to dry skin. It’s even lovely to put on during the day for a little pick-m-up; I just pat it on over makeup. The inclusion of Persian Silk Tree extract helps to minimise dark circles, fine lines and puffiness, ever the bane of my life. Of course, as with all skincare, you don’t NEED to buy the whole range to benefit. 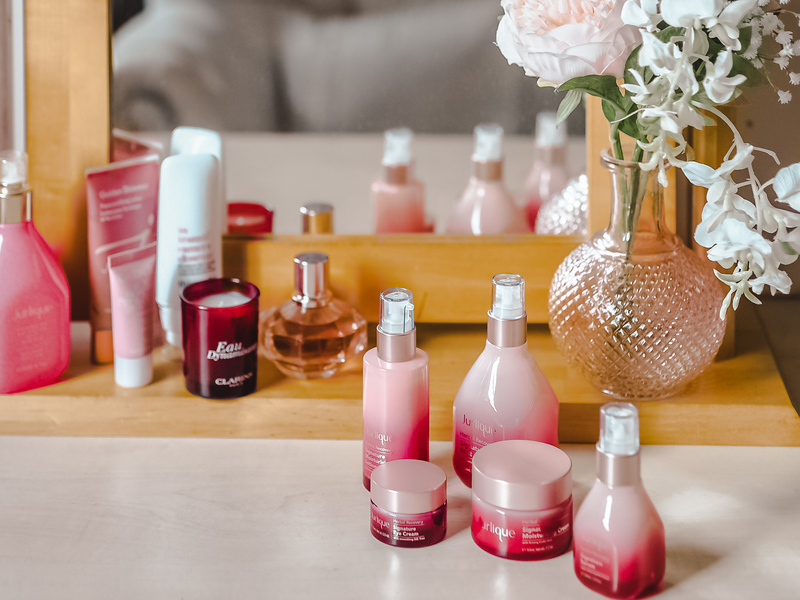 The beauty of these products is that any one of them can be slotted into your existing skincare regime. 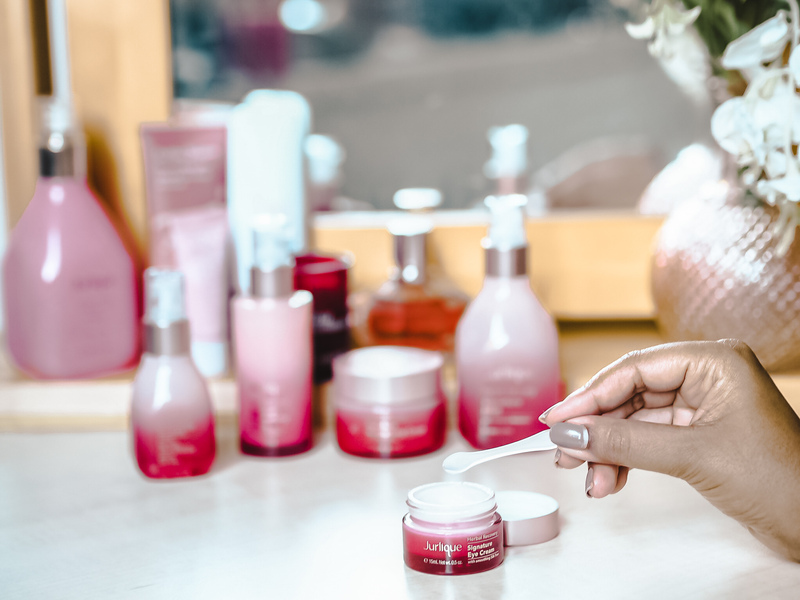 As I mentioned above, if you wanted to dip your toe in to the Herbal Recovery Signature Collection, plump for the serum to get the most bang for your buck. And my second recommendation would be the Eye Cream. What I really love about Jurlique is that it really is a case of “from seed to skin”; every ingredient is grown by hand by the Jurlique team on their farms set in the beautiful South Australian Hills. 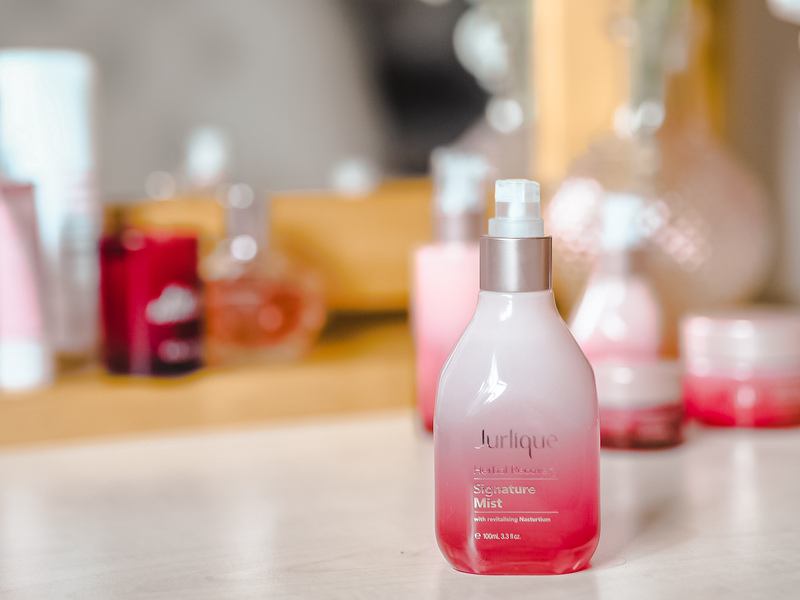 When I use a Jurlique product, I know that every ingredient I put on my face has been planted, grown, extracted and created by the team at Jurlique. The carbon footprint is minimal; the manufacturing plant is right next to the farm (they moved from Germany to South Australia for this reason) and they are harnessing the wonders of solar energy at the plant. I’d love to know if you go for natural or cutting-edge science-led skincare, or perhaps a mix of both as I do. Let me know in the comments below. These really do sound terrific! I love the idea of the mist. I have to own I have never had a jurlique product. I really must remedy that!